When Jessica Drake learned that her DNA didn't match that of her parents, she had no idea that the search for her heritage would put her family's lives in danger, or force her to cross into another world. In an alternate Earth dominated by individuals with unnatural powers called Gifts, Jessica learned that there was a curse within her blood, one so feared that all who possessed it were destroyed on sight. For she was a Dreamwalker, and the same dark Gift that would allow her to enter the dreams of others would eventually destroy her mind and spread insanity to all those around her. Now she is back with her family, but there is no peace to be found. Her childhood home has been destroyed, her mother's mind is irreparably damaged, and the Gift of the Dreamwalkers is beginning to manifest in her in terrifying ways. When a stranger invades her dreams and creatures from her nightmares threaten to cross into the waking universe, Jessica knows she must return to the alternate Earth where she was born and seek allies... even if doing so means she must bargain with those she fears the most. 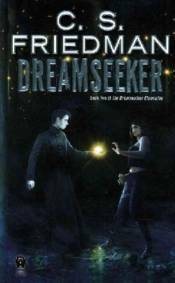 Dreamseeker is the gripping sequel to C.S. Friedman's Dreamwalker.